﻿﻿As the 20th century fades away, we tend to associate the immense mansions that once lined upper Fifth Avenue with legendary names like Vanderbilt, Astor and Carnegie. But other families, lost to the memories of most, also had incredible wealth and threw up staggering residences. Among them was Isaac Vail Brokaw. Indeed, business was such that by 1887 Brokaw was among the wealthiest men in the city. 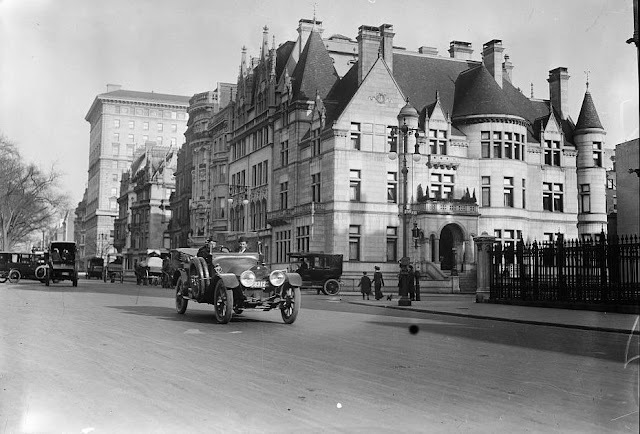 That year he commissioned architects Rose & Stone to design a grand French chateau on the corner of Fifth Avenue and 79th Street, across from Central Park. Three years after construction began, the great home was completed. The architects drew their inspiration from the 16th Century Chateau de Chenonceau. Accessed by a heavy stone portico above a wide flight of steps, the limestone hulk had all the trappings necessary for a French fantasy: turrets, gables, balconies and finials. A three-foot stone wall guarded the light moat that surrounded the home. 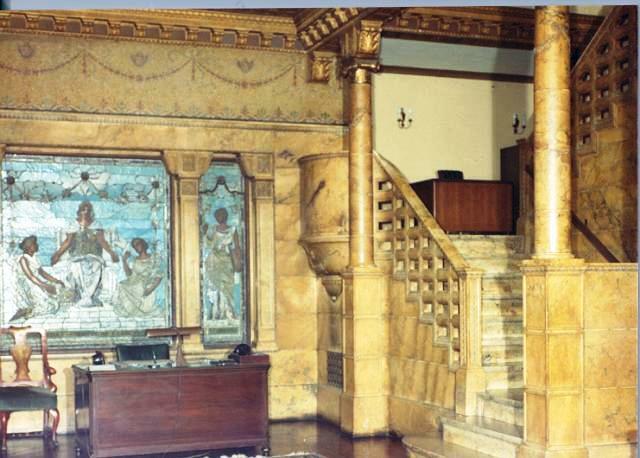 Inside, the grand entrance hall boasted Caen stone walls, intricate mosaics and stained glass panels. 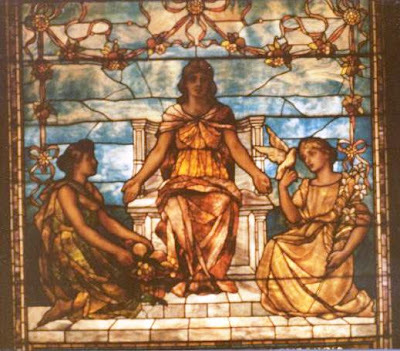 In an early and inventive use of artificial lighting, the stained glass panels were back-lit by a suspended electric globe. Elegant bronze railings swept up the staircases. The library was Elizabethan with dark paneled walls, leaded windows, a delicate plasterwork ceiling and a seven-foot tall safe disguised within the woodwork. Brokaw and his wife, the former Elvira Gould, lived in the mansion with their daughter, Elvira, and three sons, George, Howard, and Irving. To help the family get along were a houseman and helper, a butler, two footmen, two cooks, a chamber maid and parlor maid. Here on June 10, 1896 “the most fashionable wedding of the season” took place when Elvira married Carl Aage Vilhelm Frederick von Fischer-Hansen. The entire choir from the Madison Avenue Reformed Church sang as the bridal party descended the broad staircase, through the music room and into the parlor. The New York Times remarked that the groom, an attorney, “belongs to an ancient and noble Danish family,” and the couple left on the Normandie to honeymoon in Denmark at his family’s feudal castle. Unfortunately, his ancient and noble lineage could not keep him from a prison term in Blackwell’s Island some years later for complicity in bribing a witness. Elvira obtained a Nevada divorce in June 1911. She married another lawyer, William McNair, in 1914. McNair managed to stay out of prison. As the children grew up and married, Isaac began providing them homes as well. 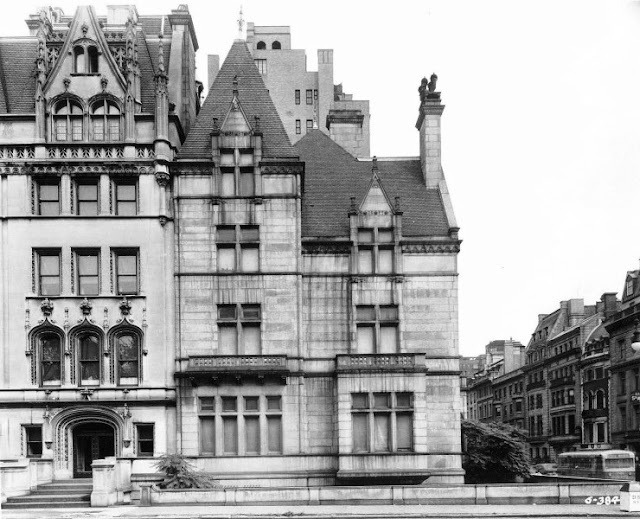 In 1905 Charles F. Rose designed matching French Gothic mansions for Howard and Irving. There was no need to build a home for George, the eldest, since it was understood he would inherit the family mansion at No. 1 East 79th Street. Upon their completion, the Brokaw compound would wrap around Fifth Avenue, halfway to 80th Street. Two weeks prior to the Tribune article the family had a scare when a black horse pulling a coupe became spooked and uncontrollably galloped down Fifth Avenue. When the horse collided with a hansom, it swerved directly toward the Brokaw mansion while the driver pulled helplessly at the reins. The horse hung, thrashing, from the vehicle’s shafts in the light moat. The entire Brokaw family rushed to the windows, hearing the pounding of the panicked animal’s hooves. When police arrived, they cut the animal free, allowing it to drop into the moat where it stayed. “It will require a block and tackle to remove the horse,” said The Times. Unnerved, Brokaw had the moat covered over. Irving Vail Brokaw died in 1907, leaving an estate of nearly $12.5 million. Mrs. Brokaw remained in the house which, The Times said, son George “will enjoy for life after the death of his mother.” Brokaw’s daughter, Elvira Brokaw McNair inherited the lot next door at No. 7 East 79th Street and $250,000 to be used to erect her own residence. In 1911 her restrained mansion, designed by architect H. Van Buren Magonigle, completed the Brokaw complex of real estate. After his mother’s death, George begrudgingly lived on in the house he intensely disliked—because of its size and cost of maintenance—through two marriages (the first to Clare Boothe who would later become Clare Boothe Luce). His life in the mansion was forced on him by his brother and the courts. His brother, Howard stepped in to block the move. Three years later, after uncomfortable court battles, the Appellate Division ruled that the house could not be sold nor razed without the mutual agreement of all the Brokaw siblings. Seven years later, on May 29, 1935, George Tuthill Brokaw died of a heart attack. His wife, Frances Ford Seymour would marry Henry Fonda a year later and have two children, Jane and Peter. In the meantime, the Institute of Radio Engineers had been formed in 1912 to not only address problems and needs of the wireless technology industry; but to create a system of standards and definitions, standardized methods of testing and rating radio equipment and industry symbols. The Institute moved from space to space for three decades until it purchased the Isaac Brokaw mansion—vacant and unused since 1938--in December 1946. While the Institute paid $200,000 for the house, it took another $350,000 to renovate it as office space. As the organization grew, it spread out into other Brokaw mansions, purchasing Elvira’s home at No. 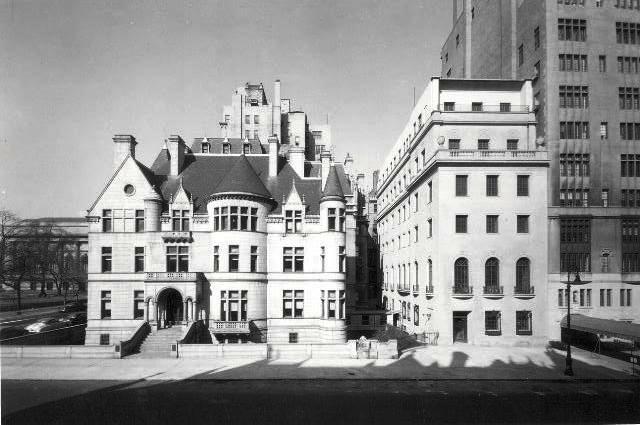 7 East 79th Street in 1954 and No. 984 Fifth Avenue in 1961. Two years later McKim, Mead & White’s glorious Pennsylvania Station was bulldozed to the ground, planting the seed of historic preservation. By 1964 the Landmarks Preservation Commission had been formed, but it carried no legal power. Preservationist were frustrated by fighting battles essentially unarmed. That frustration boiled over in September that year. The announcement shocked New York: The three houses owned by the Institute of Radio Engineers were to be demolished. Newspapers and magazines cried out against the vandalism and groups urged Mayor Wagner to give the Commission legal powers. The battle of words continued until February 1965 when demolition workers were paid overtime to begin destruction of the mansions on a Saturday—thereby precluding the possibility of a court order to stop work. What George Brokaw had tried to unsuccessfully for three years to accomplish came to be. Today a modern high-rise apartment building sits where the elegant mansions of the Brokaw family once stood. I can understand why you didn't post a picture of the ugly piece of c**p that went up in its place. This is just of typical of things in NYC - city motto should be "out with the old, in with the ugly." Another example of Penn Station mentality. The rather hideous building erected on the lot is the current residence of disgraced former NY Governor Elliot Spitzer, whose family owns it. - According to the 1910 census, 984 had 10 live-in servants, and 985 had 11, bringing the total for the three city houses then standing to 30. Ouch. And that excludes the substantial country houses each had. - There's some indication that a big bulk of the money was originally made by providing civil war uniforms. - "Chappy Morris", who shows up on society pages, is a grandson of Howard, who occupied 984 until 1959 or 1960. At the time, it was one of the very last private houses still occupied on millionaire's mile. Was anything salvaged from the mansion? Are the color photos from the 60s? The color shots were mostly from the 1960s and are owned by the IEEE, whose predecessor was the Institute of Radio Engineers. They are used, with copyright acknowledgement, with permission of the IEEE through its website. 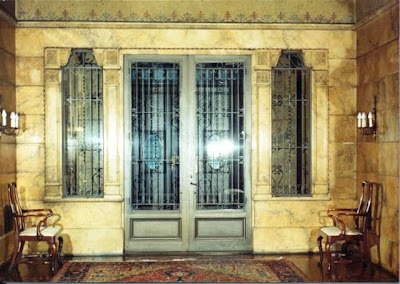 Although the mansions were destroyed in the 1906s, I cannot imagine that some details, like the statined glass, were not salvaged. But I have no concrete evidence of that. My father Salvatore Anno Panico was a worker on the crew who demolished the Brokaw mansion in the mid 60's. He salvaged a pair of walnut columns from the second floor landing which I (his son) still own to this day. 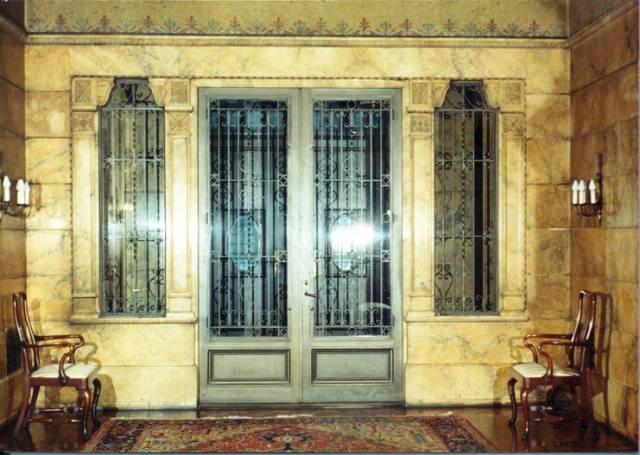 They have their original finish, weight bearing, tapered and fluted in the Ionic order with hand carved Scamozzi capitals. My fahter told me they once stood on double tiered acanthus leaf bases which were detroyed by other workers just before my father arrived and stopped them before they damaged the columns. I beleieve these are the only artifacts that were ever removed from this mansion. Great story! You're lucky to have those. Thanks for sharing. please tell me some one took those stained glass windows out before it was torn down! I've never seen any documentation that they were salvaged; and in the 1960s architectural detailing was bulldozed into the rubble. Hopefully someone got them out. Do you know how big the home was or have you ever seen any floor plans of the mansion? I've never seen floor plans but, as you can see above, it was quite an immense house. I enjoyed your piece and wanted to let you know that your quote that the mansion was "vacant and unused since 1938" is not actually true! My Grandfather, Joseph Cahalan, an Irish immigrant, was hired to live in the house as a sort of watchman by the bank that held the mortgage. He already worked for the bank as a watchman and they recommended him to the Brokaw family. My father and aunt grew up in the garden apartment on the basement level. You can find my grandparents and aunt listed in the 1940 census. My grandfather was a night watchman for the bank until the IRE bought the house. The IRE hired my grandfather as their building superintendant/custodian and allowed the family to remain in the house. My father has wonderful memories of being invited to the office Christmas party as a child. My grandparents lived there right up until the demolition began. Just thought you'd find it interesting! Thank you so much for the GREAT story and the little-known history. Your father should write down his memories of the house--they are irreplaceable pages of urban history. Thank you again. Yes, thank you for sharing. I agree Mr. Cahalan should write about his memories. I knew your grandfather during the years I worked for the IRE, 1955-1961. I saw him almost every day. I loved reading your note. He was a most kind and pleasant person. Thank you for this engaging history. As I was researching for a book on the Kress family of S. H. Kress & Co. Five, Ten and A Quarter fame, as well as the 3,100 Samuel H. Kress art collection (1800 piece at the National Gallery of Art in Washington DC, and the rest donated to over 90 US institutions), I discovered that his second wife, Frances Seymour Brokaw, and George had a daughter, Frances de Villers Brokaw (nicknamed "Pan"), who married the son-in-law of Rush H. Kress, Charles L. Abry Jr. who had married Sylvia Kress. Peter Fonda, traveling with son Charles Abry III, traveled to Rush's 72-acre estate in Ossining NY, and accidentally shot himself with an antique pistol. Young Fonda was treated by the Sing-Sing Prison surgeon, Dr. Charles Sweet, who revived Peter from death 3 times with transfusions. Many thought Peter was trying to commit suicide, because 6 months earlier, Frances Seymour Fonda committed suicide when henry Fonda eloped with a much younger Susan Blanchard in 1951. Previously, George Brokaw's first wife, Claire Boothe, worked for Conde Nast Press in Greenwich CT, and suggested to owner Conde Montrose Nast, that he start a magazine showcasing full-sized photography. Nast passed, and when she married publisher Henry Luce, suggested to him that they start Life Magazine, which was wildly successful, and launched the careers of many famous photojournalists.